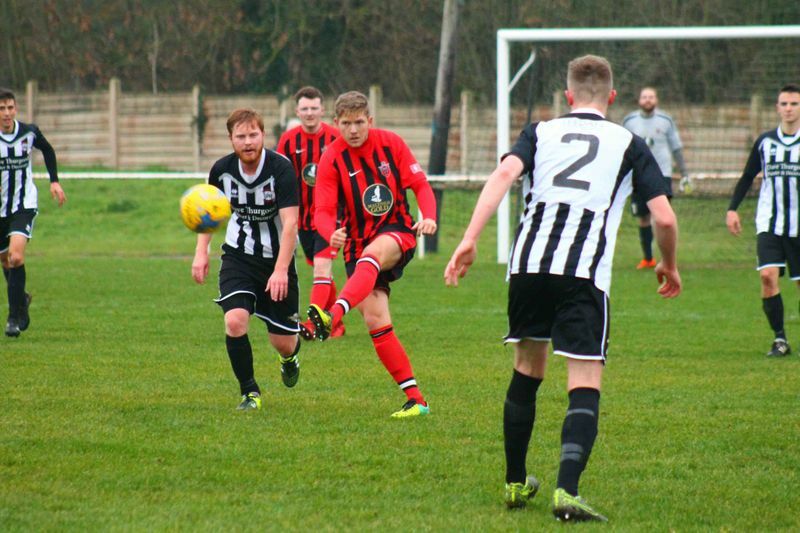 Warminster Town travelled to the picturesque and rural setting of Sherborne Town F.C. On a dark and dismal afternoon it was good to watch a performance from Warminster that brightened up the day. A very entertaining game saw the visitors come away with all 3 points with the final score, Sherborne Town 1 - Warminster Town 3. It was good to see the Red & Black’s get back to winning ways. Warminster Town started very brightly and put immediate pressure on the home side. Within the first minute they had created 2 excellent chances, which were only prevented from being goals by the commanding figure of Sherborne’s goalkeeper, Jamie Beale. Continuing the pressure it wasn’t long before Warminster’s captain, Charlie Walton opened the scoring with a powerful shot in the fifth minute after a cross from the right by left back Harry Barnes, still on that side after taking a corner, and flicked on by Jake Wright for Walton's benefit. In the 13th minute a short back pass to the home side’s keeper was picked up by George Butler who shot towards goal but the keeper got a touch and the ball went just wide of the post and out for a corner. A minute later a corner by the home side was punched clear and the corner taker Ryan Baggs picked up the ball and kicked it back towards goal to land just on the corner of the upright and crossbar. Another fine effort by Baggs came a little over 10 minutes later when around 30 yards out he sent a shot looping high and required the keeper to tip his effort over the bar. Five minutes later George Butler headed on a cross from Jack Miluk but it fell safely into the hands of keeper, Beale. Sherborne had a good opportunity to score when a long goal kick to the left was passed twice and finished up with a shot from the edge of the penalty area going just over Nathan Ball’s goal. This was a warning for the visitors of the need to close down players sooner. Shortly afterwards, once again Sherborne got down Warminster's left wing, this time striker Matthew Day taking the ball towards the touch line and a good left footed low ball somehow just avoided the advancing number 9, Pete Ireland allowing Ball to gather. Late into the first-half Charlie Walton tried to get his second with a shot causing the keeper to dive to his right to prevent the goal. There was almost an own goal scored by Sherborne when a cross from the right by Martin Johnson was uncharacteristically not held by Beale and a Sherborne defender ran into the ball driving it towards the goal but another man on the line managed to clear it. So the half finished Sherborne Town 0 - Warminster Town 1. The second half kicked off and shortly afterwards Sherborne’s number 2, Tom Budden pulled up and fell to the ground without any contact. Play was held up and he had to be substituted with what appeared to be a leg injury. Once play was resumed it looked as if Warminster were a different team and allowed Sherborne to change the way play had been in the first half. The home side almost scored from an early corner which had to be punched away by Ball. This resulted in another corner which was headed out by Warminster then headed back in and finally headed home by Sherborne’s number 5, Dan Nevens. Sherborne were now in the ascendancy and moments after the restart a good shot from the edge of the penalty area went just over the bar. More chances came for the home side but somehow they managed not to take them. It took Warminster 15 minutes to get back into the game. In the 61st minute Jake Wright gathered the ball on the left, dribbled just into the penalty area and fired low into the left hand corner beating three defenders and leaving the keeper little chance of a save. Several more opportunities for the visitors to score and increase their lead came and went. 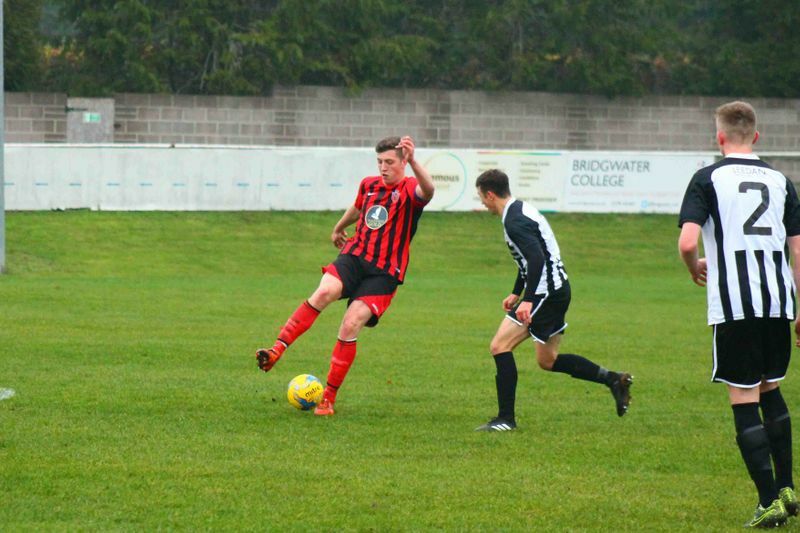 However, on 70 minutes Jake Wright once again scored when Walton crossed low in from the left to Wright waiting on the central edge of the penalty area. Wright took the ball with his right foot pushing it slightly closer to the goal then fired home with his left foot into the right side of goal beating two defenders in the process and once again with the keeper unable to get close enough to make a save. Exactly on 76 minutes Wright almost scored his hat-trick when a good cross from the left from Harry Barnes found him once again on the edge of the central part of the penalty area. Wright was under pressure from two defenders but still managed to shoot forcing the keeper to dive and push the ball away to his right. Moments later captain, Walton tried to get his second and forcing his way down through the middle into the box forced the keeper into making another good save. Not to be outdone on good saves, Nathan Ball was called into action a few minutes later and prevented the home side from pulling a goal back. 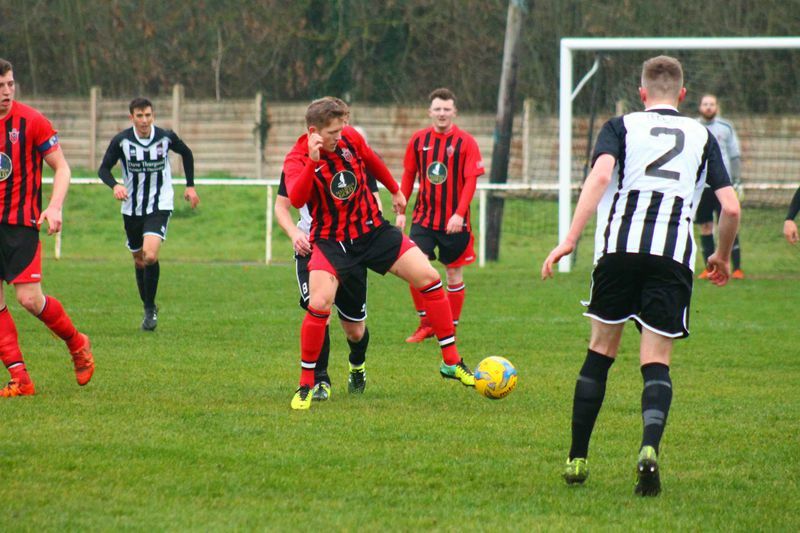 Warminster continued to press in the final minutes and shots from Jack Miluk, Jake Herd and Connor McKay all went close with the first two deflected and McKay’s needing to be saved. In this excellent spell of football Walton also forced the keeper into another save in the 41st minute. In additional time a great curling effort from substitute McKay went just wide of the right post after being crossed in from another substitute Sam Wright. 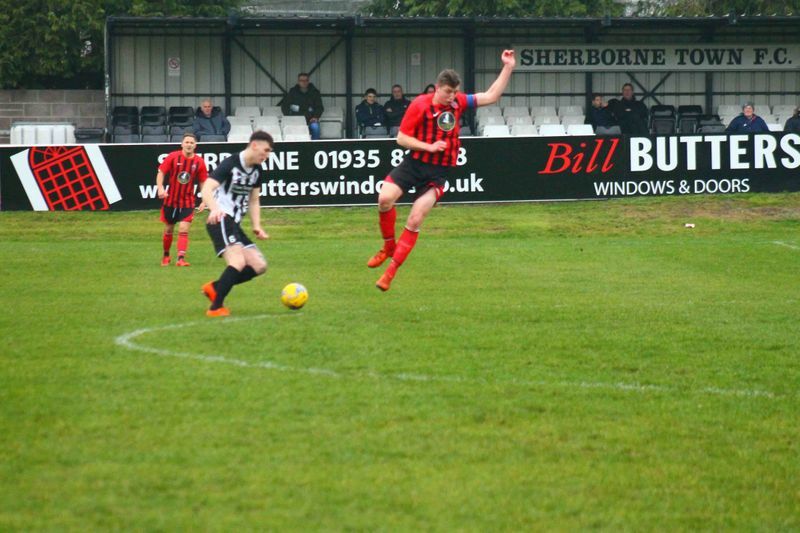 Apart from a worrying spell during the opening period of the second half Warminster put in an excellent performance and were well-worthy winners. "Andy and I were really pleased with the overall performance. It’s the best we’ve played in the last couple of months. The only criticism from the afternoon was the crazy ten minutes after the restart when we didn’t get going and conceded from a corner. Thankfully we showed great character after being pegged back and went on to score two great goals to seal the win." They next travel to Radstock Town on Saturday, December 1st. The next home game is Saturday, December 8th when the visitors are Oldland Abbotonians.